What’s the most important tool of any professional homebirth advocate? 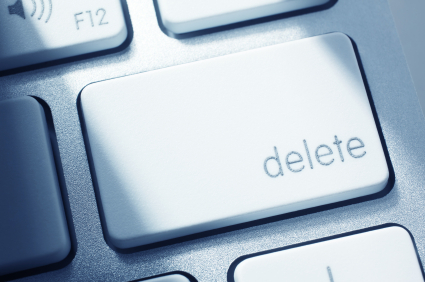 It’s the delete button, of course! At every level of homebirth advocacy, from clowns like The Feminist Breeder, through organizations like Lamaze; from self-proclaimed “experts” in obstetrical research like Henci Goer to people with academic credentials like Darcia Narvaez, PhD, the delete button is integral to maintaining Orwellian control over what people read and think. I would have thought someone like Darcia Narvaez had at least a smidgen of academic integrity, but I was disappointed. I left a comment in response to her inane post on Psychology Today entitled Jesus Had a Home Birth. True, but since the introduction of hospital birth in the US, the neonatal mortality rate has fallen 90% and the maternal mortality rate has fallen 99%! It has fallen so far, so fast, that people who know nothing about obstetrics mistakenly think that childbirth is inherently safe. A lie, based on a misrepresentation of the data. Infant mortality and perinatal mortality are two different things, as Narvaez ought to know. Infant mortality is a measure of pediatric care (deaths from birth to 1 year). According to the WHO, the best measure of obstetric care is perinatal mortality (stillbirths plus deaths to 28 days of life). According to the WHO, the US has one of the LOWEST rates of perinatal mortality in the world. Morever, as is widely recognized scientists and physicians, direct international comparisons of mortality rates are INVALID because many countries cheat in calculating both infant and neonatal deaths. They cheat by deliberately excluding very premature babies. In other words, they classify the babies who are most likely to die as stillborn (and therefore not included) even when they are born alive. That’s why the WHO insists on looking at perinatal mortality because it makes it impossible to hide infant deaths by pretending they are stillbirths. A lie. There is not a single study of homebirth in the US that shows it to be safe. Not even one. And the largest study that claims to show that homebirth is safe, the Johnson and Davis BMJ 2005 study actually shows that homebirth has a mortality rate triple that of comparable risk hospital birth. The only way that J&D could make homebirth look safe was to compare it to a bunch of out of date papers extending back to 1969. Even the papers that Narvaez cites from other countries don’t show what she says they show. She appears to be unaware that Patricia Janssen was forced to publicly retract the claims made in her 2002 paper after acknowledging that the death rate in the homebirth group was HIGHER than than in the hospital group. So in the first three claims of this post, 1 is a misrepresentation and the other 2 are flatly untrue. Unfortunately, Narvaez appears to be recycling the mistruths and lies that characterize American homebirth advocacy. Just how dangerous is homebirth in the US? According to the latest CDC data, PLANNED homebirth with a non-nurse midwife has a neonatal death rate more than 600% HIGHER than comparable risk hospital birth. In fact, homebirth is so dangerous that the Midwives Alliance of North America (MANA), the group that represents homebirth midwives, is HIDING their own death rates. They have assembled a database of 27,000 homebirths and have publicly bragged about the C-section rates, the intervention rates and the transfer rates, but they absolutely refuse to disclose how many of those 27,000 babies died. Even MANA knows that homebirth has an appalling death rate; they just don’t want you to find out. It was posted, deleted, returned and ultimately permanently deleted nearly 12 hours after it was first received. Most professional homebirth advocates are aware at a certain level that they don’t have science on their side. They readily vomit up bibliography salad, but they don’t analyze (or, in many cases even read) the citations they offer. For example, Darcia Narvaez, who presumably should know enough to check, was completely unaware that the conclusion of one of her citations was publicly retracted by its lead author who acknowledged that her claim about the safety of homebirth was untenable because the data in the paper itself showed deaths in the homebirth group, and none in the hospital group. Narvaez could have acknowledged her mistake and corrected it, but that would have required two things she apparently cannot tolerate: actual research into the topic she’s babbling about and intellectual honesty. What should women conclude from the fact that professional homebirth advocates have a totalitarian approach to dissent? They should understand that, as in the case of totalitarian governments, efforts to remove dissent and create the image that dissent never existed are tools to force or trick people into beliefs that could never be defended in an intellectually honest way. Deleting and banning reflect the desperation felt by those trying to hold onto power that was gained by lying to people in the first place. Most importantly, women (and men) should understand that professional homebirth advocates are terrified of letting people think for themselves. Who knows what might happen if they treated women like intellectually capable human beings instead of like sheep? job in making the best blog ever, thanks for the good work. the post is genuinely amazing. I have to find it where I read it, but from memory it is still significantly higher than a hospital birth with a midwife or obstetrician. That’s why the Netherlands, with its high rate of home births, has an appalling rate of perinatal mortality (the statistic that these people and Ricki Lake forget is the actual relevant statistic here) compared to overall infant mortality. website is verry helpful. Thanks for sharing.